Student offers can often be a deciding factor in choosing which Nando's restaurant to visit, especially in a high Nando's density area. Luckily we have made this page, which lists all the offers we are aware of. Enjoy! Know about an offer we don't? 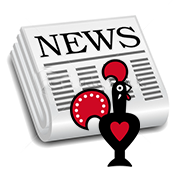 Contact us to let us know and help out other Nando's fans Nationwide! These are offers that we are aware of, but we cannot guarantee their validity. Phone restaurants directly to be sure. 20% discount to UEL students. 11.30 - 6pm all year round.